People all over the world spend tons of money on beauty products to counter the effects of aging. They buy creams, serums, and gadgets in the hope that looking their best will help them to feel their best as well, but creating beauty from the inside out just might be a more effective approach. One of the best ways to achieve a beautiful, youthful glow is to make sure that you are getting the proper balance of nutrients your body needs to maintain vibrant health, and there are a whole host of superfoods that are particularly rich in vitamins and minerals that can help you achieve luminous skin, lustrous hair, and the unmistakable radiance of someone who is wholesomely nourished. Here are a few of my favorite anti-aging superfoods and the ways they can help you achieve a beauty that is more than just skin deep. You’ve probably heard about Goji berries and Acai berries, but the Camu Camu berry is still relatively unknown. It is a cherry-like berry that comes from the rainforests of the Amazon and it is one of the most potent natural sources of Vitamin C in the world. Vitamin C is know for its immunity-boosting properties, which can ward of colds that could leave your skin puffy and dull. This berry can help to boost your beauty in other ways, too. Eating foods that have high concentrations of vitamin C has been linked to skin that is smooth, supple, and hydrated. I get my daily mega-dose of vitamin C by adding Berry Bliss Superfood + Protein Blend, which has a hearty helping of organic camu camu powder in it, to smoothies, yogurt, or oatmeal. I love fresh mushrooms, from Shiitakes to Portobellos, but my favorite mushroom, by far, is the Reishi mushroom. This particular species of fungus is one of the most potent superfoods in the world and has a host of health benefits including anti-cancer properties and neuro-protective properties. Plus, it has also been used in traditional medicines for thousands of years for its anti-aging effects. Reishi mushrooms contain hundreds of bio-active compounds, many of which have shown to posses anti-inflammatory effects, detoxifying properties, particularly with regard to the liver, and the ability to prevent the development of fat cell development. Because Reishi mushrooms are quite bitter, they are best when used in a powder form that is combined with other ingredients. I blend organic Reishi mushroom powder with raw cacao powder and vanilla to create my ultra-healing Cacao Magic superfood blend that can be added to all of my favorite foods. Don’t let the bright green color keep you from enjoying the health benefits of this superfood. 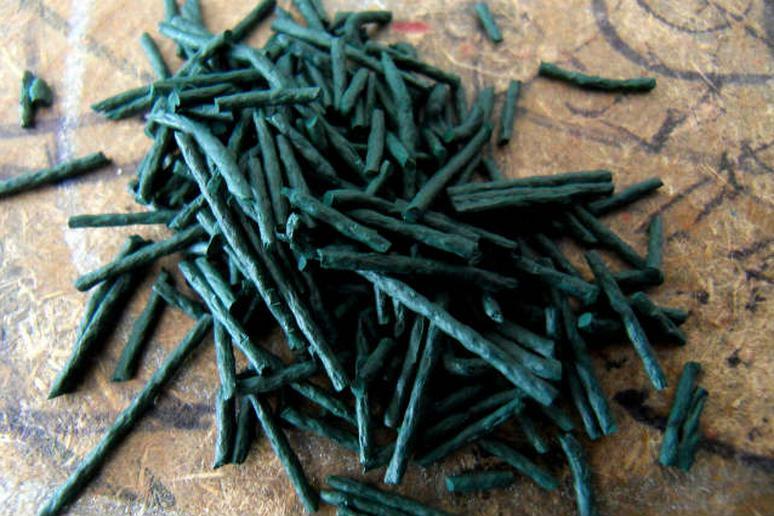 Spirulina is a blue-green algae that is incredibly rich in antioxidants, vitamins, minerals, and protein and it is a beautifying staple in my diet. It is packed with vitamins A and E, both of which are incredibly important for healthy skin. Spirulina is also known for its ability to remove toxins and excess waste from the body, which can help you maintain that toned, lean appearance. Add a dose of spirulina to your favorite green smoothie to supercharge it with anti-aging powers. Sometimes it’s fun to save the best for last, which is why I put this sweet superfood at the bottom of my list. You may think of chocolate as a temptation, but in its raw form, cacao is a rich and delicious way to boost your natural beauty. It is packed with nutrients that combat free radicals that result from sun exposure, stress, and environmental toxins. The antioxidants in cacao can mitigate the negative impacts of free radical damage that often lead to physical signs of aging and illness. While some people apply cacao topically, I like to savor the luscious flavors of this superfood and add it to my favorite paleo-friendly baked goods, like my Cacao Magic Cupcakes! They are packed with healing superfoods, which means that I can have my cake and enjoy radiant beauty, too.